Major Richard S. Harper enlisted in the Marine Corps Reserve and graduated from MCRD San Diego 7 August 1981. Major Harper attended Texas Tech University and graduated 17 December 1984 with a Bachelor of Science Degree. He was commissioned a 2nd Lieutenant through the Platoon Leaders Course 6 April 1985. Major Harper reported to The Basic School Quantico, Virginia 10 October 1985 and began training with Company A Class 1-86. After completing The Basic School he was selected to represent the Marine Corps in a NATO Military Pentathlon Competition conducted in Athens, Greece. Returning Conus 15 August 1986 he quickly assimilated into the convening Infantry Officers Course and graduated 17 December 1986. He was designated an MOS 0302 Infantry Officer and ordered to duty with 1st Battalion, 4th Marines, 7th MAB, 29 Palms, California. Major Harper served as the 1st Platoon Commander, Company A, 1st Battalion, 4th Marines, Executive Officer, Company A, and Weapons Company Executive Officer. In April 1989 he received orders and reported to Marine Corps Security Force Guam as the Security Force Guard Company Executive Officer. On 1 December 1989 he was augmented into the Regular Marine Corps and remained on station as the Security Force Guard Company Commander. Major Harper requested and was accepted to Naval Flight Officer training via the Supporting Arms Coordinator (Airborne) program. He reported to Pensacola, Florida 11 May 1991 and began Naval Flight Officer training. He received his Naval Flight Officer insignia 20 November 1992. He subsequently completed the Electronic Warfare Course, Corry Station, Florida and EA-6B in-type training, Whidbey Island, Washington. 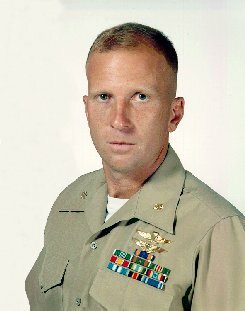 Major Harper was redesignated a MOS 7588, Electronic Counter Measures Officer 19 April 1994 and ordered to duty with Marine Air Group-14, 2nd Marine Air Wing, Cherry Point, North Carolina. Major Harper was assigned to VMAQ-4 where he served as the Future Operations Officer, Assistant Aircraft Maintenance Officer, and Squadron Logistics Officer. He additionally deployed to a myriad of worldwide locations to support operations in Sigonella, Italy; Iwakuni, Japan; and Aviano, Italy. Flying in excess of 1,100 Mishap-Free Hours in the EA-6B he was able to assist his squadron by supporting NATO Operations Deny Flight, Decisive Endeavor, and Deliberate Guard. Returning conus from Aviano, Italy 1 March 1997, Major Harper volunteered for duty with 2nd Air Naval Gunfire Liaison Company (ANGLICO), II MEF, Camp Lejeune, North Carolina. He graduated Army Airborne training 20 July 1997 and assumed command of the 1st Brigade Platoon. He received his Navy/Marine Corps Parachute insignia 5 November 1997. He deployed in support of the 82nd Airborne Joint Readiness Training Center evaluation 1-98, II MEF Strong Resolve 98, Norway and Burmese Chase 98 exchange with the British 148 Commando Battery. While deployed to England Major Harper completed training thus earning the British Parachute insignia. Major Harper's personal awards include the Air Medal with Strike / Flight device, Army Commendation Medal and 2 Navy / Marine Corps Achievement Medals.